Because of a legal dispute over trademarks, some of the best-known places in Yosemite National Park may soon change their names. If something is not done, the historic and world-famous Ahwahnee Hotel will become the Majestic Yosemite Hotel. This is not simply a name change, it is another gross humiliation for the people of America. A case where an ineffectual federal government squanders 100 years of American history and heritage through incompetence and maladroit negotiating. The people who love our national parks are rightfully angry. Stephen T. Mather was the first Director of National Parks in the United States. He accepted the position in 1915 when there were only 16 national parks – today there are 58. 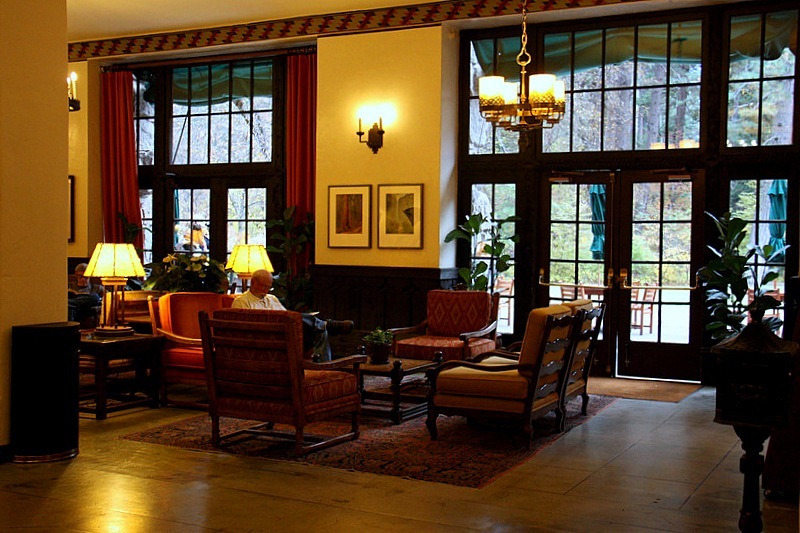 Mr. Mather used the iconic Ahwahnee Hotel in Yosemite Valley to propel the success of the entire National Park System. Here’s how it all happened. 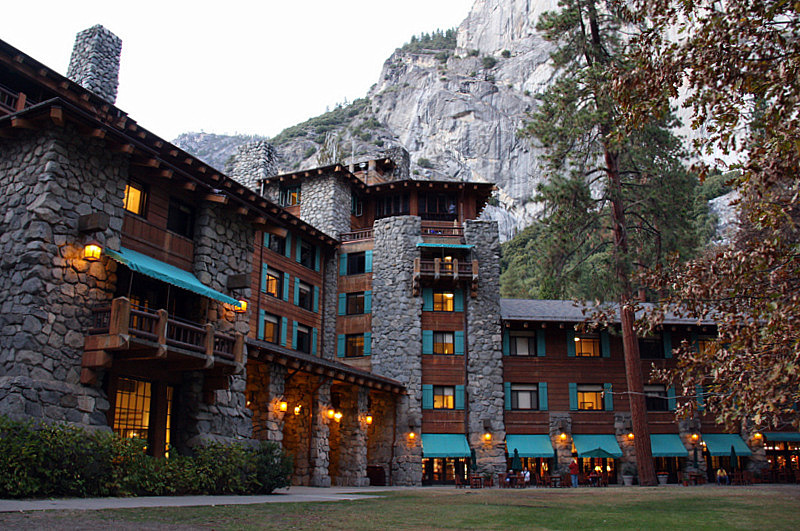 Mather built the Ahwahnee Hotel in his favorite park in Yosemite, California in 1927. It was to be the Crown Jewel of National Park Hotels, and for a very good reason. 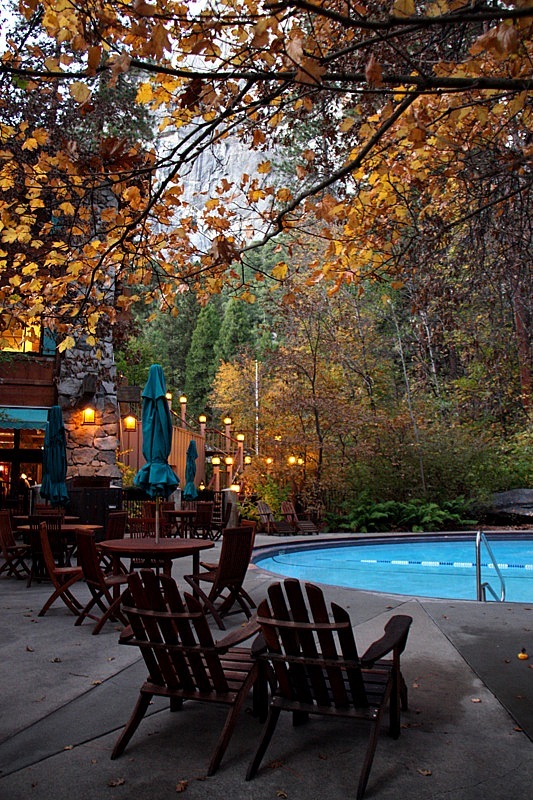 Stephen Mather wanted his Yosemite hotel to be a wilderness destination for the rich. Not because he wanted to cater only to the wealthy, but because he knew that if he could interest influential people in the National Park System, he could build better parks for everyone. His plan worked beautifully. The Ahwahnee was built with the best of everything, from newly invented electricity to bathrooms in each guestroom, and an elaborate kitchen that would provide extraordinary dining to the hotel’s privileged guests. Two electric elevators were installed and manned by staff operators. Noise reducing plaster was applied to interior walls to assure that guests were not disturbed by the roar of nearby Yosemite falls. The Ahwahnee Hotel structure looks to be made of rock and timber, but in reality the primitive looking exterior siding, balconies, and beams that appear to be timber are actually constructed from cement castings superbly stained to match the surrounding redwoods and pines. We have visited the Ahwahnee Hotel many times over the years, but until we did the research for this article, we had no idea the exterior walls were indeed made of cement. It was the largest such task for the burgeoning young American trucking industry of the 1920s. Trucks ran on dusty roads day and night, seven days a week for over a year to bring materials to the Ahwahnee worksite. All building materials for the six-story hotel were imported from outside the park. That meant hauling nearly 700 tons of steel I beams along with 5,000 tons of building stones, and 30,000 feet of lumber and logs with early model trucks along bumpy dirt roads. Add to that the many tons of hotel furnishings, and the kitchen and maintenance equipment necessary to run a luxury hotel. It was a huge undertaking for more than 250 drivers, workers, and artisans to create the timeless lodging masterpiece that we now so revere. Stephen T. Mather did himself, and America proud. The hotel had its grand opening on July 14, 1927. 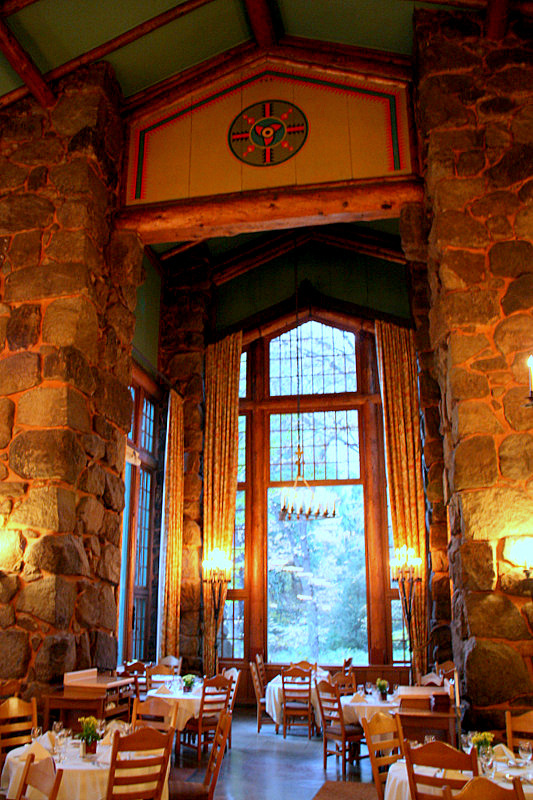 Dining was important to the wealthy, and in the Ahwahnee Hotel, the master architect Gilbert Underwood provided Mather with one of the most memorable grand dining rooms in the world. The dining room stretches 130 feet from the elevator lobby toward Yosemite Falls and spans 51 feet from side to side. Its vaulted ceiling crowned with stripped pine rafters and trusses is 34 feet high. Imagine the difficulty of trucking the dining room’s 11 plate glass windows that are 24 feet high on early California furrowed roads up to the building site of the Ahwahnee. One can only guess many windows were broken along the way. Consider also that once the windows arrived on site they had to be positioned without the aid of modern moving equipment – fascinating. The great dining room timbers are huge bare pine columns that support a weighty truss ceiling. Unknown to the observer is that the pine columns are actually hollow concrete encased steel pillars. Once again, the genius of the architect is displayed. The rustic appearance of the dining room echoes the overall woodsy splendor of the plan. The immensity of this magnificent room dwarfs the 350 guests it can seat. Located at the far end of the dining room, the alcove appears as an add-on to the vast main room before it. It has one of the 24-foot high glass windows, and in this instance, the window provides a showcase for the Upper Yosemite Falls and makes for an unforgettable setting. The alcove has hosted many historic events including a round table dinner with Queen Elizabeth and Price Phillip during their visit in 1983. The Queen and Prince hosted a small dinner in the alcove after attending services in the park’s historic little wooden chapel. When not arranged for special events, there are a number of tables for two set up in the alcove. The window center table is often reserved by newlyweds. Your authors had the distinction and privilege of having dinner at that special honeymoon table on their wedding night many years ago. As we did on that night, we have often thought about the destinies of the hundreds – perhaps thousands of newly married couples that toasted and celebrated their future at that very spot over the last 90 years. 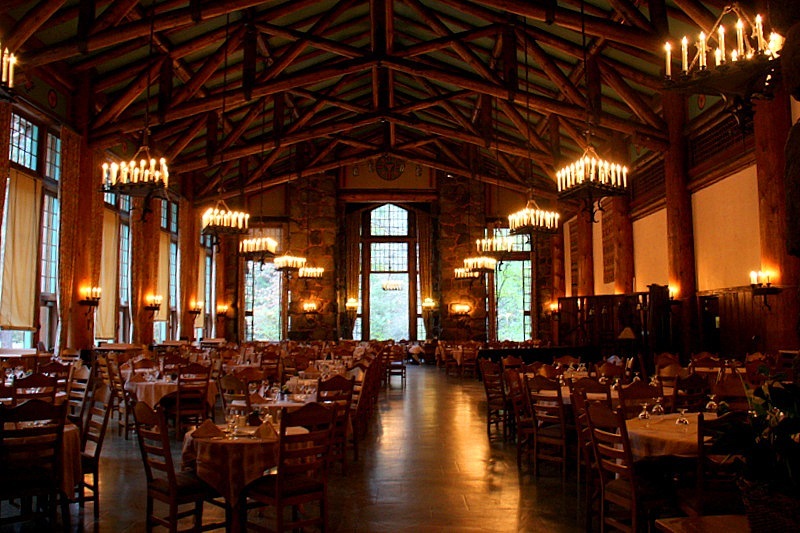 The beautiful Ahwahnee Hotel is host to about 200 weddings per year. If you are planning a wedding – it is an incredible venue. The Ahwahnee has a Native American theme, and the chosen decorators did a superb job of blending the furnishings with the overall character of the property. Much of the furniture at the Ahwahnee is original with only subtle changes in fabric and design made to please contemporary tastes. When the stock market crashed in 1929, the number of visitors to the national parks dwindled, and the Ahwahnee fell on hard times. The president of the Yosemite and Curry Company (YP&CC) decided that publicity would boost the Ahwahnee occupancy rate and he hired a young aspiring concert pianist, who was also a part-time photographer, to photograph and promote the hotel and the Yosemite experience. The young man’s name was Ansel Adams. The rest is history. 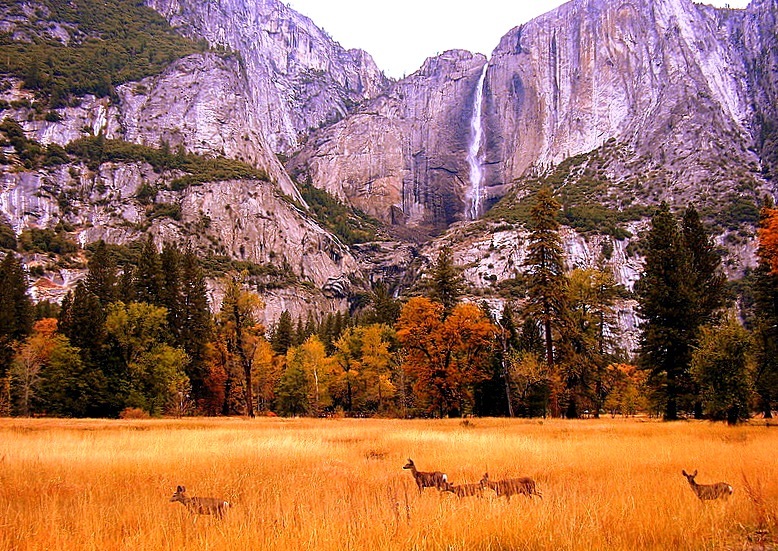 His work, like that of John Muir will live as long as there is a Yosemite Valley. Adams was in love with the beauty of Yosemite from an early age. 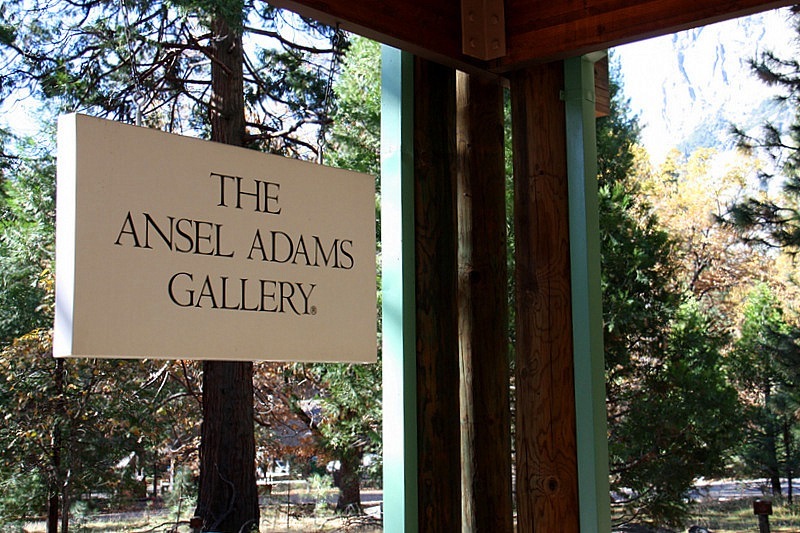 He finally moved from San Francisco to Yosemite in 1937, and although he created visual masterpieces in other parts of the west, he remained intimately connected with the valley and the Ahwahnee Hotel for over 40 years. He retired in 1972 and died in 1982. 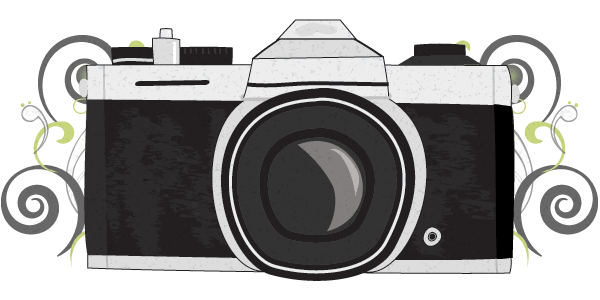 He left behind a treasure trove of photographs of natural wonders. The US Navy appropriated the Ahwahnee Hotel to be a convalescent hospital for sailors in June 1943. 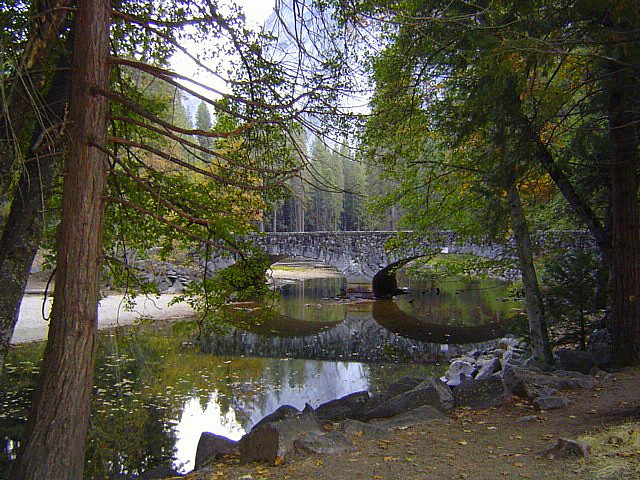 Before it was returned to the YP&CC in December of 1945, more than 6,700 patients had been treated at the Ahwahnee. When the Navy vacated they left behind many buildings including a bowling alley, gymnasium, machine shop, pool hall, and foundry. The buildings were quickly dismantled and the salvage was put to good use in the valley. The guest elevator was automated in 1963. A small swimming pool was added in 1964 in a non-obtrusive space next to the bar. Air conditioning was added, and all the windows in the guestrooms were replaced in 1976. There was a golf course, but it was removed before 1980 in order to preserve the primordial nature of the surroundings. TVs made their first appearance in the guestrooms in 1989. 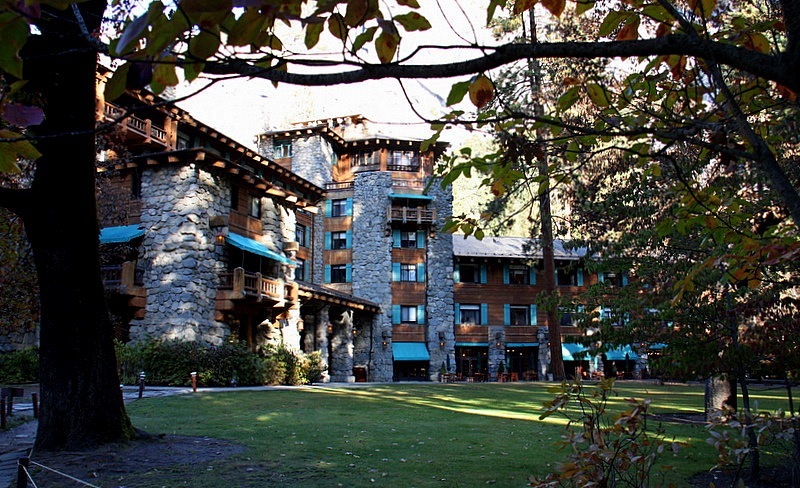 The Ahwahnee Hotel was put on the National Register of Historic Landmarks in 1977. 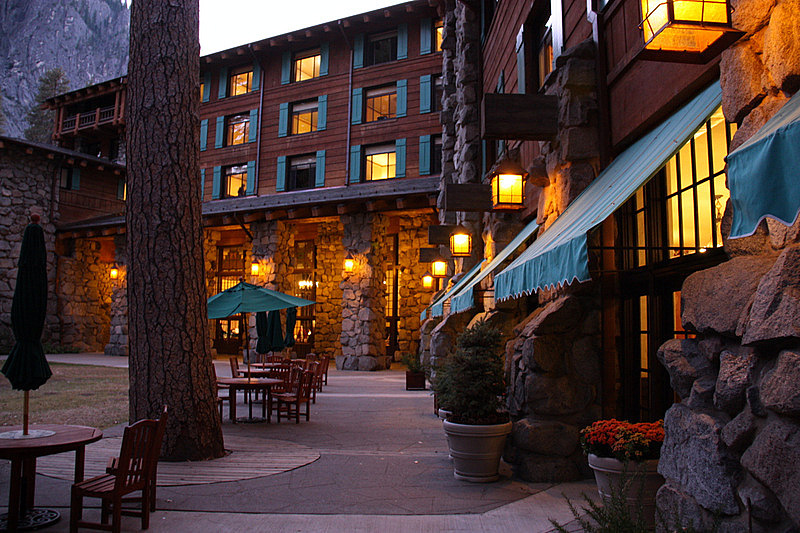 The American Automobile Association (AAA) has designated the Ahwahnee a Four Diamond Hotel. If you would like to read more detail about the Ahwahnee Hotel there are two short, but excellent books on the subject. . The Ahwahnee – Yosemite’s Grand Hotel, by Keith Walklet and The Ahwahnee – Yosemite’s Classic Hotel, by Shirley Sargent. Both books are available from Amazon.com. 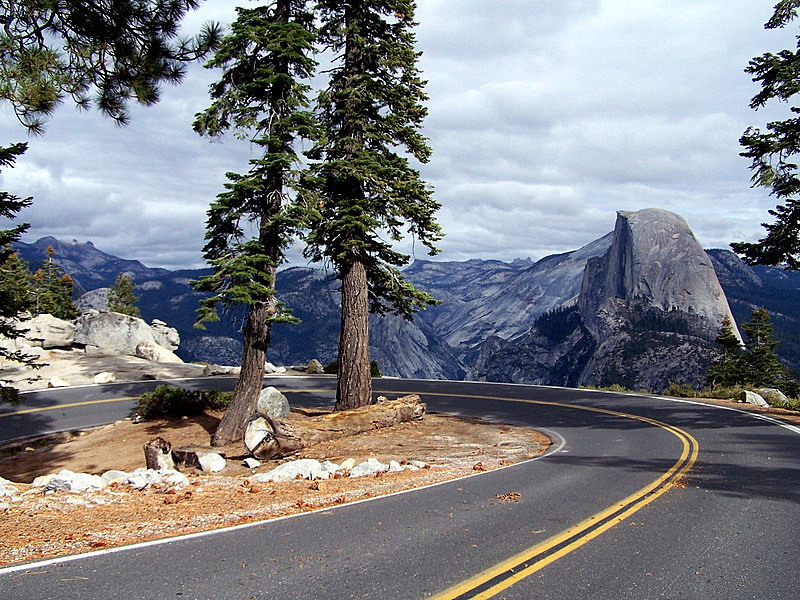 There are several entrances to Yosemite Park and you can choose your route from the park website. 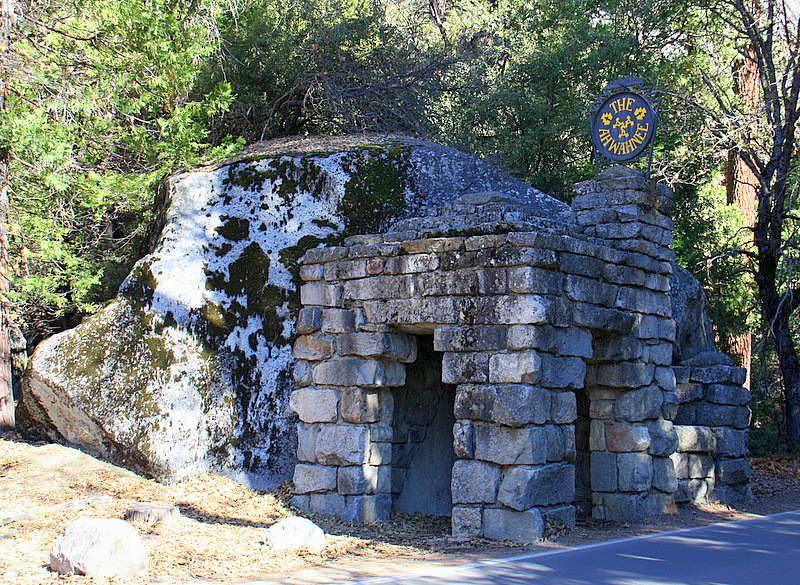 As you drive through the park, watch for signs to the Ahwahnee Hotel. A magnificent stone gatehouse at the entrance to the hotel gives the visitor an exhilarating sense of arrival. The leafy, tree-lined drive beyond the gateway increases the anticipation, and the Sequoia lined parking area provides a warm welcome to all visitors. You are privileged to be about to enter one of the grandest rustic hotels in the world. 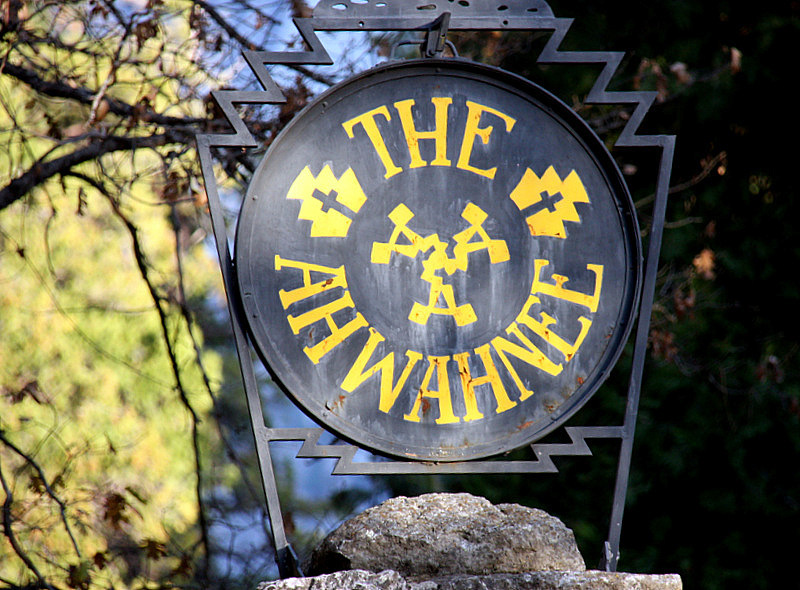 Whatever it is eventually named, it will always be the “Ahwahnee,” to many generations of proud Americans.